Easy to prepare, nutrient-rich, low-calorie domestic hijiki. Delicious when combined with tofu, spinach, or rice, and as an additional ingredient in croquette or hamburger dishes. This domestically produced, prepared, and packaged natural kome hijiki is richly seasoned, and will soon become a favorite. Kome hijiki is the bud of the hijiki, and has been used as a traditional component of Japanese cuisine for centuries. It is bursting with gentle flavor, combining low caloric content in a nutritious food that contains high amounts of calcium, iron, and dietary fiber. Our hijiki has already been largely prepared for you, and adding it to a dish is a simple matter. Simply mix it into your ingredients, in its frozen state. 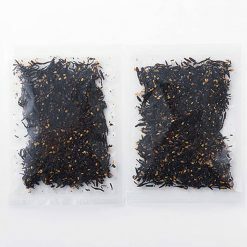 It thaws between 5 and 10 minutes.In addition to adding a striking shade of black to your dishes, hijiki’s distinctive yet gentle flavor can provide extra dimension to your dishes. 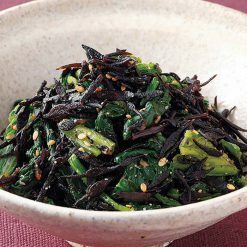 Most commonly used in vegetable and seafood dishes, hijiki absorbs dressings and sauces well, and adds a delightful crunch to a salad. For a heartier take, cook it in soup stock (dashi stock bases are most common and highly recommended) along with a mix of vegetables, tofu, or fish. Another recommended way to enjoy hijiki is to mix it in with your hamburgers, or croquettes. The texture does good job of adding variety, and the added nutrition is an excellent bonus. 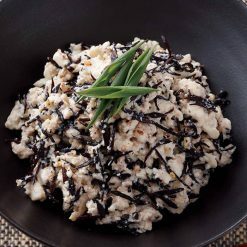 It is also fantastic when mixed with miso and vegetables in a fried rice. This product contains dry hijiki (domestic), fructose glucose liquid sugar, sesame seeds, salt, dried bonito extract, soy sauce (including wheat), fish sauce, yeast extract. Origin of ingredients: hijiki (domestic). Prepared and packaged in Japan.